The Metro service in Rennes, modeled on the Siemens VAL transportation technology commenced operation in the month of March in the year 2002. The service, at present, has just one line- Line A. Travel between the two terminals takes a mere sixteen minutes while lift services are available at all the stations. The network has thirty trains for service. If the Lausanne Metro service and the miniscule network of underground transportation in Serfaus are not taken into account, then Rennes ranks as the smallest city in the world to boast of its very own Metro service. While the number of trips is quite low at present, predictable increases over the coming years can result in possible gridlocks along the system, particularly during the hours of heavy traffic. The signages at the stations along the network are in French so tourists may be required to ask for help from the friendly French nationals while travelling on the Rennes Metro service. It has a daily ridership of 135,000 as of 2012. Line A runs over a distance of around ten kilometers from La Poterie to J.F.Kennedy station via Gare de Rennes in a predominantly south-east to north-west orientation. There are fifteen stations along the route of which thirteen are underground facilities. Plans are in place for the introduction of Line B, the second line of Rennes Metro that will have an orientation along the south-west to north-east direction. It is set to become operational by the end of this decade, approximately around 2019. The trains begin operations at around 05:00 am in the morning and run till 01:00 am, the next morning. The service boasts of an amazing frequency- you need to wait only eighty seconds before another train comes along. The metro has one line which serves 15 stations over a total system length of 9.4 km (5.8 miles).It runs between J. F .Kennedy and La Poterie stations. The total distance between the start and end stations, can be covered in sixteen minutes. Map of Rennes Metro showing its lines and stations. Download Rennes Metro Map in PDF. 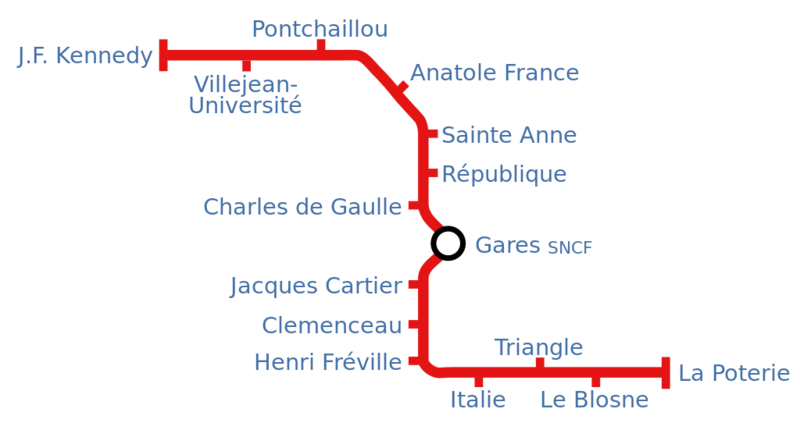 The metro system connects the main train station to the city center, the hospital, the Villejean University, the town hall and other important landmarks. All the items / belongings that are left behind on the STAR network can be collected from their Lost and Found Office. They are held by STAR till Wednesday, after which they are handed over to the custody of the City of Rennes. STAR can be contacted at 09 70 821 800 from Monday to Friday between 7:15 am-7:00 pm, and on Saturday from 8:45 am-5:15 pm. The office is located at 12, rue du Pré Botté à Rennes. After Wednesday, people can contact the Lost and Found service Rennes at 02 23 62 18 72. There are various types of ticketing options available to suit the needs of passengers. Riders can purchase a one hour ticket. This ticket is valid for one hour after the first validation. The ticket is non- transferable and can be used to make unlimited number of the rides on the STAR bus and metro during the validity period. It can be purchased for €1.50. Booklet of tickets can also be purchased that provide savings on a single ticket. A carnet of 10 tickets can be purchased for €14.50 and can be used for unlimited rides on STAR metro and bus. Each ticket is valid for one hour and also includes transfers. These are non-transferable. Another option is Formulas 10, 30, 50, 100 tickets. These tickets are booklets that are loaded on the KorriGo card. Each ticket is valid for a period of one hour and allows a person to take unlimited rides on the STAR subway and bus network, including transfers, within the validity period. Formulas 10 ticket costs €13.05, Formulas 30 tickets costs €36.25, Formulas 50 tickets costs €58.00 and Formules 100 tickets costs €108.75. Another convenient option for passengers travelling with the KorriGo card is Formule liberté. It allows traveling with payments made in the future. Between the 9th and 12th of each month, the bank accounts are automatically charged for the number of journeys that were made in the previous month. It also provides savings as it costs €1.40 instead of €1.50 for a single ticket valid for one hour. Tickets are also available for 1-7 days. The 1-day pass is priced at €4.10. While the 2- day pass is just double of it, €8.20. The three and four day pass cost €11.40 and €13.60 respectively. A ticket for 7 days costs €13.50 for people under the age of 27 and €17.90 for the rest of the population. The metro offers its passengers park and ride facilities at selected stations.